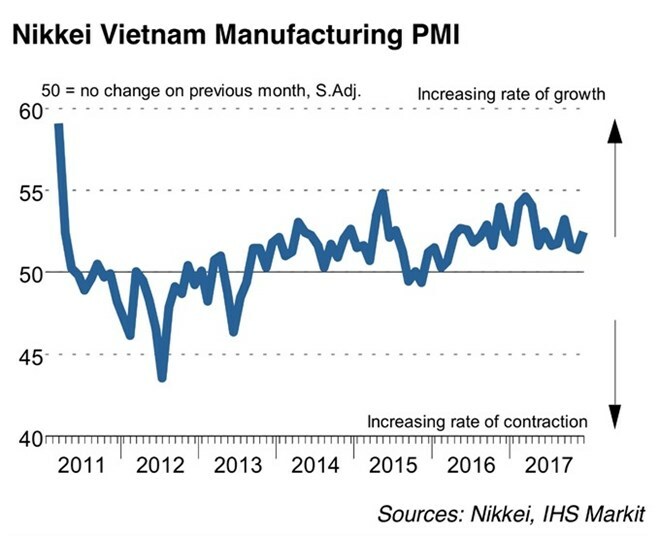 Hanoi (VNA) - It was a positive end for the Vietnamese manufacturing sector in 2017 with the Manufacturing Purchasing Managers’ Index (PMI) rising to 52.5 in December from November’s 51.4, according to the latest survey from Nikkei’s IHS Markit that released on January 2. This is also the highest PMI in the last three months of October, November and December. Nikkei evaluated that one of the factors leading to the improvement in operating conditions was a return to production growth. The modest increase in output in December followed broadly unchanged production volumes in November. Increased consumer demand also reinforced optimism that output will increase in the next 12 months. December’s business optimism improved to a nine-month high. A rising production demand contributed to the 21st consecutive monthly rise in employment at Vietnamese producers. The pace of job creation was the strongest since September. Costs of raw materials such as oil and steel rose while prices of materials from Chinese suppliers increased, leading to a sharp rise in input costs in December. This led to an increase in output price. Delivery time of suppliers continued to be extended in December. Members of the survey team said late delivery was mainly due to the shortage of raw materials. Delivery time increased for 11 consecutive months.